Here's to another Super Bowl win! 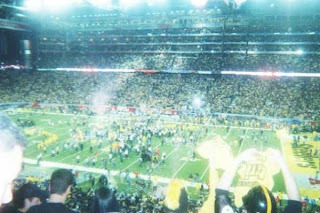 I went to Super Bowl XL in Detroit and it was an amazing experience. I forgot my camera but I did buy a disposable. yeah it might be just a northern California thing, because I think it's more like... hippy-ish down here. Where as southern California is more like you know, orange county/L.A., etc. And here it's San Fransisco and all these places in the Bay Area. Literally I would say about 95% of my school smokes.. and my school is one of the smartest schools, i'm surprised people are able to do it and still be incredibly smart and normal. But, honestly it's rare that I meet anyone who doesn't smoke pot. Just another reason for me to move! I'm not a huge football fan, but I was rooting for the Steelers, and I'm thrilled that they won! That was a great game!